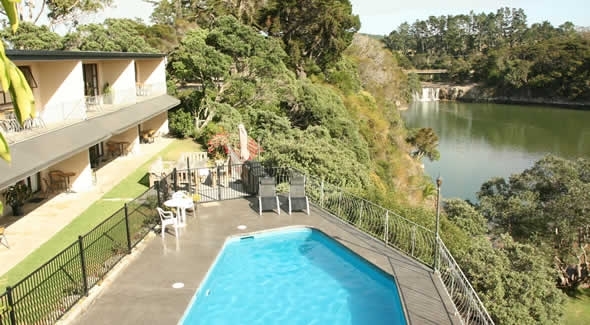 Situated overlooking the Haruru Falls, Waitangi Lagoon and Reserve, and 4 km from central Paihia along the main route to Kerikeri, Falls Motel & Waterfront Campground is ideally situated Paihia accommodation while exploring all the Bay of Islands and Far North have to offer. Falls Motel, Paihia motel accommodation is elevated above the Waterfront Campground and offers unobstructed views over Waitangi lagoon and Haruru Falls, you can sit out on your private deck or patio enjoying the peace and spectacular views. All rooms have 32" LCD TV's, DVD players, great beds and we offer free WiFi to all guests. The Waterfront Campground is situated on the water's edge facing Haruru Falls and you can walk from your site right onto our private beach, a setting you won't forget no matter how many places you visit. Our facilities are clean, we don't charge for hot showers and have free use of gas BBQ's and Wifi. Kayak hire is available for our guest, DVD library for minimal charge. 3 hours drive North of Auckland, we are a convenient Paihia accommodation base and can organise your complete holiday for you exploring the Bay of Islands and Far North. There are many attractions, activities and things to do in Paihia, Bay of Islands. The cultural experience of Waitangi, the history of Russell, our unspoilt beaches and forests, a dolphin cruise, the thrill of our wonderful snapper/kingi or Bill Fishing Charters, day trips to Cape Reinga and 90 Mile Beach, or just relax and enjoy our setting and facilities. You can book many of your trips and tours through us, some where we can offer discounts, send us a email to arrange your trips/tours before arrival and have a look at our Activities Activities for some great ideas. A family owned and operated motel and waterfront campground in Haruru Falls, Paihia. Don't forget to check out our "Hot Deals"